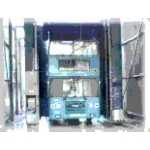 All drive through or pass through bus wash and lorry wash units are available in various sizes and wash combinations, built to the customer's requirements. Automatic cycles are programmed to suit the demands of the operator and size of the fleet. Built from rigid galvanised frames the 2 brush or 3 brush roll-over units can be built in various combinations and layouts to meet customer requirements. 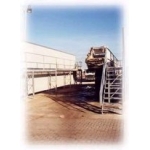 Optional features include automatic frost protection, guide rails or under chassis washing. The system is manufactured and installed to suit all types of vehicles operated and the size of the fleet, and used by many operators where their simplicity of design and reliability are unequalled. All systems can be used in conjunction with a water reclaim unit.